Steve Earle's, "Careful what you wish for - you don't know till you try", is the standing refrain in my mind these days. Apparently my estimation of a blowoff differs significantly from the markets imagination of one. A sincere mea culpa on my part for attempting to paint the market's portrait in difficult light. In my defense, I've always been more of an impressionist painter than a realist. To date, the correlation inkwell that I often pen from for shades of relationship colour has run dry leaving the market's throttle wide open to run towards the path of least resistance - which for the entire span of 2012, has been straight up. Momentum, as many great traders will tell you, is a difficult dynamic to appraise - let alone fight. Buy high, sell higher was coined in environments such as these. Sounds ridiculous mind you, but it's a philosophy and style that has merit for the nimble and the trained. 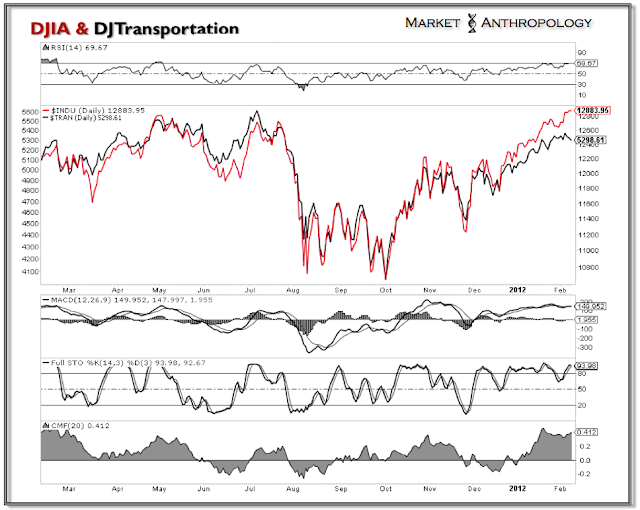 The charts can give some guideposts and hazard signals along the way, but just as an oversold market can become more oversold - the same is true with momentum. With that said, another week and another 20 handles or so on the SPX. In hindsight, the respective volatility gurus were spot on in anticipating the significant compression in volatility and a return to normalcy - which if I understand correctly, runs counter to the much darker parallel universe of the "New Normal". And while I remind myself of the caution implied by this autumn's rare occurrence of realized eclipsing implied volatility - the pendulum reflex delivered in mean reversion has ushered in the inverse dynamic. 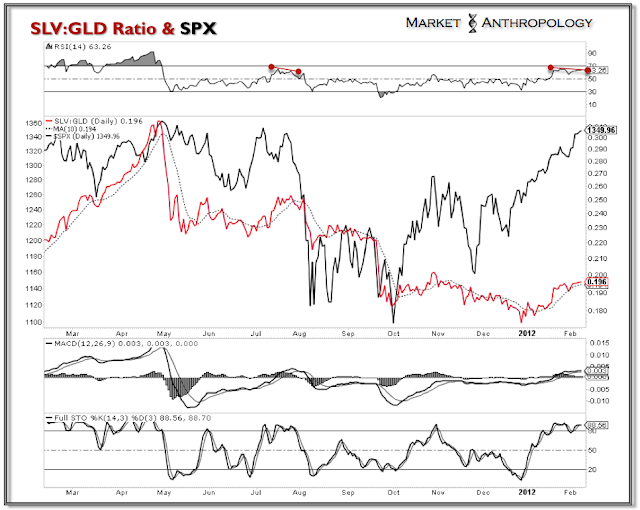 This in hindsight should come as no surprise, however, for those of us approaching things from the top down, the shot across the bow is what matters most - just as the extreme reading in the markets new highs minus new lows was in early October and the swift and traumatic loss of pressure in the precious metals market in December. Who knows what the impetus for the next catalyst will be, but I can tell you that the tail has widened appreciably since this fall. In terms of a broad-brush technical picture, overhead resistance was broken last week in the SPX and the XLF, although it shouldn't come as a great surprise - considering the Nasdaq broke out a few weeks before. Certainly with my market posture, it would have been clean and neat for resistance to have held, although I continue to operate through the biased lens that the equity market's are passing through the honeymoon period, imbibed by global easings and similar to the fall of 2007. This approach is not for the faint of heart or traders with very short timeframes, as it can certainly be trying on ones patience and P&L. It is never a straight line, and in hindsight, there is always a better method to capture a thesis. I simply operate from where I sometimes feel comfortable - waiting on a train. Of course like normal, comfort is a relative phase these days. 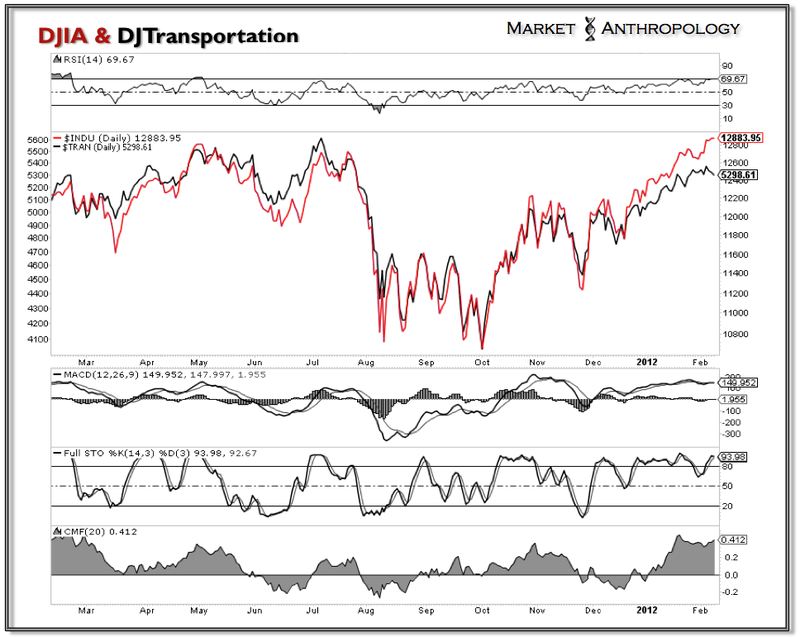 The bearish technical du jour for the moment appears to be the Dow Jones Transportation Index, which stalled out last week and has a head or false start on the downside. 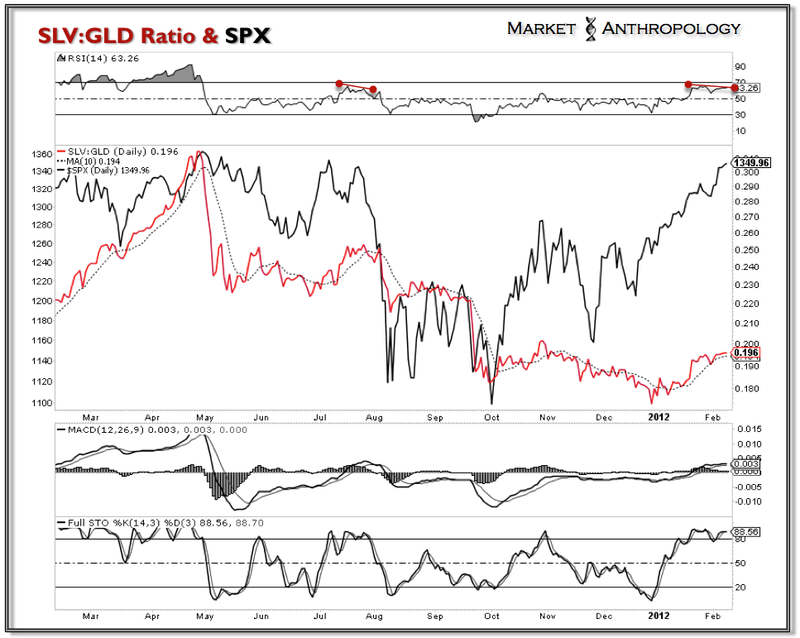 I am also closely watching the silver:gold ratio as it appears to be approaching another pivot. Lose silver's approval and the rally should dull to a lead luster. See further rational for this, Here. 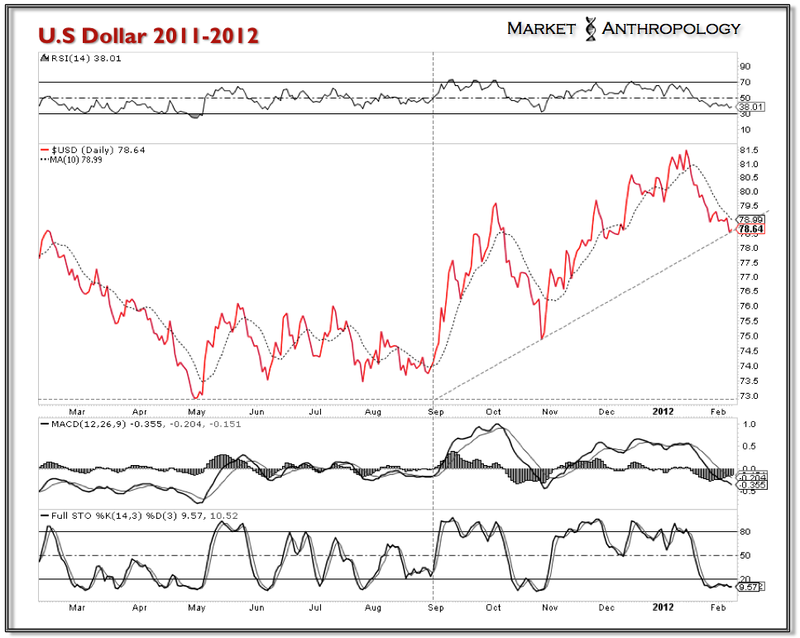 The dollar also appears to be coming into support. 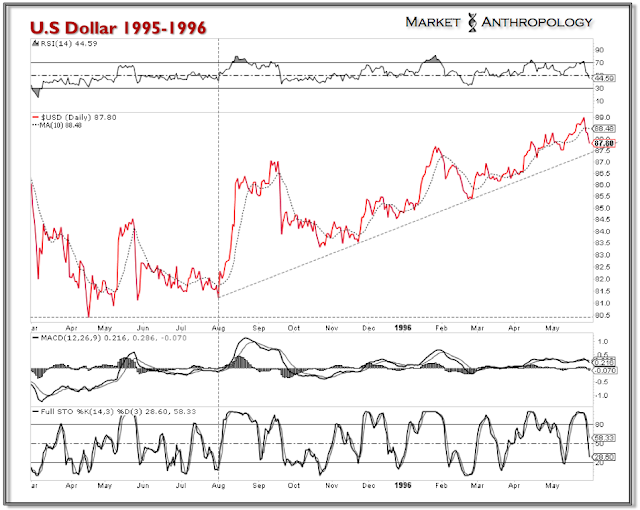 I find the most recent secular pivot in 1995 and 1996 as having some notable parallels to the current market structure in the dollar. In the anecdotal department, we appear to have a confirmed name for this blowoff wedgie. Like last April, its named after an esteemed and often bearish economist. Mr. Roubini was nice enough to lend his support for this rally - more than 22 percent off the lows and with sentiment reaching the often uncouth and beer laden cheap seats. If nothing else - they are as consistent as German engineering in markets such as these. Further paging through my anecdotal notes, I will leave you with some thoughts from a longtime reader and pension fund manager who sent me this nice note last week. crossing a significant threshold, this is something I thought you might appreciate. 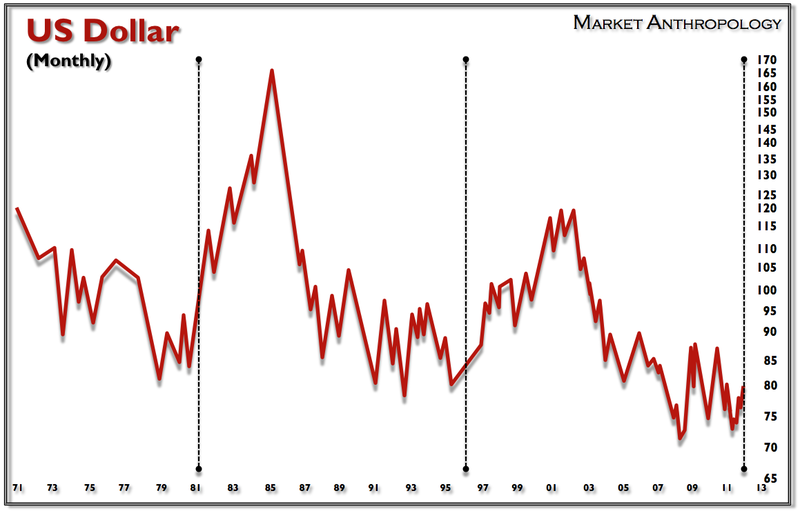 and we'll start buying at or near the low and the cash level will then go back down to 4%." remained in the 4-5% range. in 1999 and August/Sept 2007, they are always a bit early. 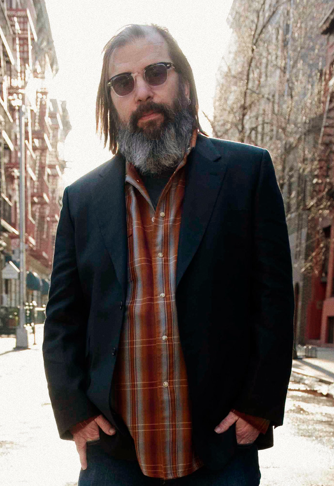 And while the Larry Fink's are dancing with reckless abandon to the market's tune of late, somewhere Chuck Prince is getting goosebumps and thinking, "If I were you, I'd reach for that chair right about now - it's the Transcendental Blues."